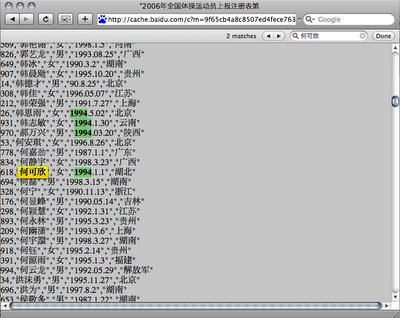 Google's cached copy of the spreadsheet does not contain Hexin's age record, and Baidu's does. This does not necessarily imply that Google allowed its data to be rewritten by Chinese censors, but the possibility does present itself. 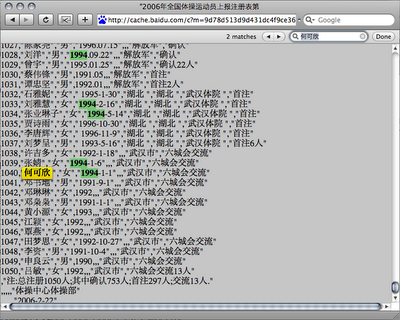 From the minute I pressed the publish button on this blog, the clock is ticking until Hexin's true age is wiped out of the Baidu cache forever. It is up to you, the folks reading this blog, to take your own screenshots and notarize them by publishing them. If you put a link in the comments section, I'll post it.